Harry L. Smith. Memoirs of an Ambulance Company Officer. Chapters 5-6. FERDINAND FOCH, CONVINCED THAT THE LAST great German offensive which Eric von Ludendorff launched on March 21 had spent its force, gave orders for the advancement of a counter offensive, the first phase of which was to begin July 18. The enemy, striking at the French in March with no less than 1,800,000 men, had eventually extended his operations on a front of 100 miles, gaining important but costly victories by hurling dense formations of infantrymen again and again into breaches in the Allied lines. He reconquered the Somme area, but was stopped by a series of strategical maneuvers formulated by Foch, in the area near Chemin des Dames. On May 27 Ludendorff's final offensive movement began. Deploying 400,000 men, the enemy succeeded in reaching the Marne sector, and German troops were within 40 miles of Paris when American forces in effective numbers reached France. Foch now proposed to attack the uncovered west flank of the German salient which extended from the Aisne to the Marne. The Fourth Division participated in this Allied offensive drive, but not as a distinct unit. From July 18 to July 22 the Fourth Division brigaded with the Sixth French Army, commanded by Major-General Dégoutte, an officer whom American commanders, including Pershing, later had cause to distrust. Our division was still under the command of Major-General George H. Cameron. On the 18th of July one brigade captured the village of Noroy; on the 19th it advanced two and one-half miles farther. The other brigade assisted in capturing Hautesvesnes and Courchamps and Chevillon, and won other substantive victories. On the night of July 17, however, I left the division and went from May-en-Multien to Vendrest, to help the French run a dressing station there. I took two men with me, and as it happened, they were the two largest, toughest men of the company. We lumbered out of May-en-Multien, forth in the pitch-black night in one of the big General Motors ambulances. For illumination we had to depend wholly on the occasional white glare of a Véry light to the northeast, or the relatively lighter gleam of a chance patch of lime or chalk-surcharged soil looming ahead in the rutted road. Men were everywhere on the road; men in trucks, men in wagons, men in automobiles, men on horseback and men on foot; bicyclists and motorcyclists; men in good health and bearing and men borne head-first on litters. At some time during the dark hours we rattled into what was left of the shattered village of Vendrest. Poking about amidst the heaps of crumbled masonry and rubbish of the deserted streets, we found the dressing station in the cellar of what once had been a school building. Work was already in progress; wounded soldiers were lying on stretchers and blankets on the floors; their wounds had been dressed as well as circumstances would permit, and they were ready to be evacuated back to the quiet sectors to the southwest of Paris. Litter-bearers were bringing in other men, and in spite of the tenseness which pervaded the place, the work seemed to be going satisfactorily. I could speak only a little French, and I could understand much less than that when French was spoken to me. The argot left me quite helpless. So I did what I could, trying to act on the strength of interpreting motions of a Frenchman's arm, or watching his nod. There were plenty of assistants, and they were all busy. As I worked, I tried to learn who was in charge of the station, and from what I could observe, a French chemist was the chief. At about 5 o'clock the next morning, some 10 or 12 French soldiers whirled up on bicycles, threw themselves from their saddles, and clattered down into our cellar. Such a jabbering I have rarely-heard; they shrieked, grimaced, tossed their dusty arms about in the air, and capered about on the stone floor, with never a moment of quiet. I was first alarmed; next amused; and finally perplexed. "Qu'est-ce que c'est!" I asked the little French chemist. "Qu'est de manque?" The diminutive chief of the dressing station wheeled around, swept his arm in a wide semicircle as if to point to the front lines far beyond the town, and chattered: "Le boche! Il parte, il parte!" This news, relayed graphically but unintelligibly to us by the delighted and voluble French cyclist, was the first we had had of the Allied successes of that phase of the offensive. I felt considerably more secure, but the shambles of a village was still the target for intensive artillery fire from German gunners. I spent the day of July 18 in Vendrest, and great shells screamed or burst into thunderous fragments all through that pulverized area. It was my first experience of heavy gunfire, and I cannot say that I enjoyed it. In the afternoon the fire became so heavy that we thought of taking more secluded cover, but as dusk approached, the German shelling died away and left us in comparative peace. An incident of the early afternoon however, was as vivid as any I have ever read or heard described. While we were still in Vendrest, a corporal named Pederson came as close to perdition as any man may ever do and yet escape with a whole skin. He was sitting on an old broken-down settee in front of a ruined shop, smoking or enjoying a short respite from the arduous labors of the night and morning. I was only a short distance away, assisting the French in burying their dead. A French Catholic priest, chaplain to one of the French units, was officiating at interments. He could speak English rather well, and we chatted as much as men may in the midst of such somber duties. Suddenly, the fierce shelling of which I have written began. Shells seemed to burst with tremendous detonations all around us. "Are you afraid, lieutenant?" the French priest asked me as we half ran, half crawled to cover. "I don't know," I stammered, "I can't tell; this is the first time I've been under fire!" A shell crashed into the steeple of a church near us, and we decided to try for the cellar of the dressing station. Corporal Pederson, spying us from his settee in the wretched street, leaped up and ran to join us. We heard a piercing shriek, a gigantic blast, and we saw a huge fount of dust and splintered debris shoot up into the air in a murky cloud of smoke. In the spot where Corporal Pederson had been sitting there was now a gaping hole so large that a horse could have been buried in it. But the agile corporal was safe and sound. The commander of the Tenth French Army, General Charles-Marie Emmanuel Mangin, was overjoyed with the electrifying successes of the American troops on July 18. He sent a jubilant message of congratulation to the Third American Corps, saying that American infantrymen went forth into battle as if they were rushing to a carnival, and he pointed out that 7,200 prisoners, 91 field-pieces, and 10 kilometers of the enemy's territory had been taken. The delight of General Mangin may or may not have been a reaction to the dark days of 1917, of which at least one journalist wrote that no less than 87 French regiments of the line either revolted outright or were found to be seething with revolt. Much has been written since the war about wholesale rebellion in the French army in 1917, but we of the American forces were in no position to ascertain the truth or falsity of such rumors at the time. We did, however, learn enough to realize that the morale of some of the French people whom we knew was dangerously low at the time we landed in France. Defeatism, rather than rebellion, seemed to be the sentiment we encountered in France. On the 18th of July, Count Georg von Hertling, chancellor of the Imperial German Government wrote; "We expected grave events in Paris for the end of July. That was on the 15th. On the 18th even the most optimistic among us understood that all was lost. The history of the world was played out in three days." Lieutenant-General Robert L. Bullard, commander of the Second American Army, wrote concerning our men's fighting of July 18 and 19; "The men of the 4th Division went forward to victory and to the 'backbone' of the salient, the Soissons-Château Thierry highway; but they were handicapped by French mistakes and by their own greenness. They were reckless, careless and brave, but they paid too high a price." "'It was glorious, heroic,' said French officers, 'but not war.'" It was Major General Joseph Dégoutte, of the French. who was largely responsible for the French mistakes Bullard refers to. French shells, supposed to have been sent far over the heads of the Americans, at one time actually fell upon our men. We, of course, knew nothing about either General Mangin's jubilation or Von Herding's consternation. We knew only that the enemy had been repulsed, that he had been driven far back for an indefinite distance on this particular sector, and that the French, who had fought up and down these rolling slopes for four years, were beside themselves with joy. It was perhaps their hysterical delight, rather than any real idea of American successes that we had at the time, which imbued us, non-combatant units as we were, with a surge of pride in the prowess of the American infantryman. We could not as yet know the reaction of the enemy to these strange warriors who did not shoot and take cover, as the French did, but who crouched and stumbled and floundered ever forward until bullets or bayonets halted their indomitable advances. To be blunt, the European troops of the Allies were all but exhausted; the Americans had a spirit that was whetted to a fine edge of wilfulness and abandon. It may be true that they rushed into battle with only scant heed to the commands of their officers, yet they confronted the Kaiser's most dogged soldiers with a dash and an eagerness for combat that must have outfaced those Teutonic idolators of Wotan. It may not have been war, as the academician Foch is said to have remarked, but it WAS magnificent, and it DID win more territory for the Allies than four years of trench warfare, with short, sporadic advances from French to German trenches, had been able to win in years of bloody strife. It was the open system of offensive maneuvers that had been advocated by Pershing, a wise general with a long background of experience in open fighting behind him. His American Expeditionary Forces fought as he wished them to fight, and in the end they toppled Ludendorff's incomparable war machine into disaster and utter rout. They finally did what no army before them had been able to do: they smashed at least a part of a great host that had been girding itself for 20 years before the first sword was drawn. I returned to the Fourth Division on July 19 to find that although the division had not yet fought as a separate, independent American organization, casualties among those of our division attached to the French were frightful. The 58th Infantry Regiment, commanded by Colonel Carroll F. Armistead, was the first to go into battle; it took the village of Chevillon and won congratulations from Major-General Gaucher of the 164th French Division. But Colonel Armistead's regiment also lost hundreds of men. By the time I had rejoined my comrades, the 59th Infantry Regiment, under Colonel Benjamin F. Atkinson, was already in the midst of a furious assault on the sector designated by the road between Sommelans and Monthiers, bolstered by a heavy barrage from French artillery. The success of Atkinson's men was such as to astonish French officers, but his regiment lost 1,041 men in that episode. Such terrific losses as those that were common at this time meant that we of the ambulance company would have nothing but work before us for many hours to come. I remained in the ruined village of Chezy, assisting the, French. As the wounded were brought back stealthily by ambulance or by litter-bearers, we received them, re-dressed their wounds and adjusted their splints or applied new ones. We tried, as speedily as we could, to segregate the wounded according to the severity of their wounds, and we evacuated the men to hospitals at Meaux, Joinville, and Guitriem. The Fourth Division, with the exception of the 10th Machine Gun Battalion, was ordered to fall back to the vicinity of the town of Brumetz on July 20 for a rest. On the night of that date I proceeded to Courchamps. It was ebony-black, with not a star in the skies above, and the road, which probably was never very good in times of peace, was now abominable. 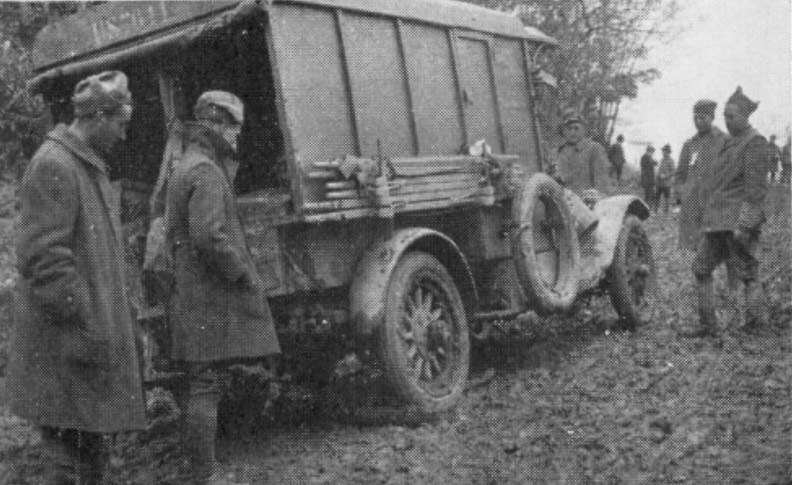 Rain fell in great sheets, and as we gingerly guided the General Motors ambulance in and out of the greasy ruts, we had to pause at intervals to allow throngs of French infantrymen to pass us. But we reached Courchamps without being blasted to bits by a chance shell, and we stayed there for a day and part of a night. The dead a physician sees in civil practice are those whose lives in most instances could not have been saved. Even in death, many persons have a tranquil appearance, as if a deep calm has somehow come to them unsolicited. The physician who encounters death in civil life is saddened by it, but he is not affrighted by the horrible realization that the coming of death was needless and unwarranted. What I saw at Courchamps was unlike anything I have seen before or since that day. The stench of necrotic human flesh rose heavy and oppressive in the blazing sun. Dead German soldiers lay in numbers exposed to the searing rays, their arms and legs crazily contorted or bent back grotesquely on their bodies like the arms and legs of a rag doll, eyeballs staring white and sightless and some even protruding from the sockets. Dead horses, bloated enormously into huge bladders, with rigid, outthrust legs and gleaming teeth bared fearsomely, sprawled where they had fallen to earth. Flies were everywhere; they swarmed in beady black ropes over the dead, and drove us well nigh to distraction as we vainly tried to eat near our field kitchen, which we had set up next to what was left of a stone wall. Flies covered both utensils and food; crawled fitfully over the rude boards we used for tables; buzzed about our heads as we slashed impotently at them with one arm. They seemed particularly repellent to us on that steaming day, for they had respect for neither the quick nor the dead. Next, I went to May-en-Multien, but on the same night, I went to La Ferté-Milon to report to Major Harrison Webster, senior surgeon of the 47th Infantry Regiment, whom I was to see later under tragic circumstances. On July 21, Sergeant Day, a mess sergeant who was a graduate of the Northwestern University Conservatory of Music, reported to the surgeon of the 59th Infantry Regiment, and thus we were separated insofar as our company was concerned. Private Baker of our organization was gassed and evacuated at this time. We could see, as we bumbled along the road, a company of French soldiers as they surreptitiously approached the town. They proceeded according to a technic that was taught Colonial woodsmen in America by the Indians: they peered cautiously from behind cover, dashed forward a few yards, threw themselves flat or found other natural shelter, then advanced again. It was slow, but relatively safe. I watched these soldiers so intently that I forgot about my own danger, until shells began to tear large holes in the wheat fields near us. But we poked about the village unharmed, and since we found no site that was to the Frenchman's liking, we returned to headquarters. But we left him alone in his infamy. In all armies there is a certain number of malingerers; that is to say, soldiers who inflict certain injuries on themselves or fake the symptomatology of certain diseases to keep from being sent to the front or to keep themselves from being taken into the army. The incidence is probably about the same in all armies. The Germans had their share of such men. The distinguished German physiologist, Dr. William His, while on general recruiting duty during the World War, encountered some malingerers and later wrote about them. He discovered that some soldiers would drink coffee to excess and swallow stumps of cigars to produce so-called fast hearts simulating real heart disease. Other men deliberately acquired gonorrhea. Others produced ulcers of the skin and prevented healing of them by the application of vinegar, solution of bichloride of mercury, and other caustic agents. Some malingerers would traumatize their ulcers when the lesions were covered by plaster-of-paris dressings, by pressing wire under the dressings and thus abrading or macerating the. wounds. There was scarcely a physical limit to which some of these men would not go in their frantic efforts to avoid danger at the front. Their resourcefulness was amazing. The subject of malingering is not a happy one, and few generals or other officers who write memoirs refer to it. It did exist, however, in the American army during the World War and it has existed in that army in other wars, and since it did exist, I see no reason to deny it. It is a subject. of prime importance to both the line officer and the medical officer, and although the civilian rarely bears of it, it is discussed with great anxiety among the chiefs of every large armed force. Upton remarked, in his Military History of, the United States, that malingering was so extensive in the United States Army during the Civil War that by June, 1862, it became necessary to prohibit the issuance of discharges for "rheumatism." In the final year of the Civil War, the number of soldiers absent from the theatre of war without authority ("AWOL," in the modern soldier's lexicon) was more than one-half the total number of soldiers actually in the ranks, actively bearing arms. In general, it may be said that malingering is practiced for the purpose of avoiding dangerous or unpleasant duties in an army, to obtain hospital care and rest, to procure discharge from an army, with a view to securing a pension or other form of compensation for spurious injuries, or to avoid being drafted into an army. The practice is most common among soldiers in newly-raised troops, among offenders in the guardhouse, and among conscripts. Old soldiers are deterred from malingering less by the threats of eventual punishment than by their own self-respect. Laignel-Lavastine and Paul Courbon, who made a study of the evil, distinguished three types of malingerers: (1) those who feign somatic disorders such as self-inflicted mutilations or self-induced diseases, (2) those who feign functional disorders, and (3) those who feign functional disorders grafted on genuine organic disease. Some of the supposed ailments commonly presented by malingerers are impairment of hearing, impairment of vision, nervous afflictions, mental disease, paranoia, melancholia, episodes of fainting, epilepsy, paralysis, migraine, and the like. 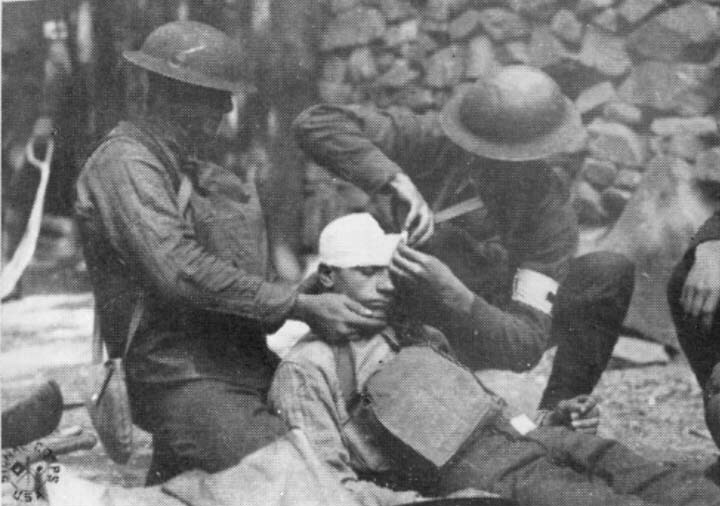 Soldiers during the World War soon learned how to fake the effects of a severe attack of gas poisoning. They learned how to produce diarrhea by the ingestion of drugs, and to initiate loss of weight by deliberate starvation. Venereal disease often was deliberately contracted and then carefully controlled or sometimes aggravated in order to escape military service. High fever was simulated by the soldier's squeezing the bulb of a thermometer to cause the mercury in it to rise, by rubbing the bulb briskly on a rough blanket, or by placing it in a mouth already containing hot water. Spitting of blood could be simulated by making minute lacerations in the mucous membranes of the mouth. Edema, or swelling, was faked by the soldier's tying elastic bands tightly about a limb and leaving the bands in place overnight. Jaundice could be well-approximated by a man's swallowing a capsule containing five grains of picric acid. Soldiers were even ingenious enough to reproduce the appearance of gangrene by binding tightly to the skin a copper coin that had been soaked in vinegar. Variola, or smallpox, was simulated by puncture of the skin in many places with a needle dipped in croton oil. Eruptions of several kinds were caused by rubbing the skin with oil or juice obtained from ranunculaceous or euphorbiaceous plants. A common self-inflicted lesion in the Italian army was an abscess produced by the injection of gasoline, turpentine, benzine or chloride of lime. Emphysema, or the escape of air from the lungs into other tissues, was achieved by the introduction of air into the subcutaneous tissues. It could be done by means of a hypodermic syringe, or by making an incision in the skin and forcing air into the tissues through a straw. Sometimes a catheter was used to introduce air into the urinary bladder, a most dangerous procedure. Wounds were delayed in healing by the application of chemical irritants or by mechanical means. Mutilation of some member of the body, such as occurred in the injury of the soldier I had encountered, was common. In Austria many soldiers shot themselves through their left hands and claimed the injury as a valid lesion of war. This practice ceased when it was ordered that all men exhibiting such a wound should be executed within 24 hours after discovery. Twenty-four men in a single division of the Austrian army were said to have been executed in one day for possession of such a wound. It could be said that the inventiveness of the malingerer was one of the most astonishingly effective talents developed by the World War. On July 24 our company moved forward to the shattered village of Monnes, from which vantage-point our ambulance could, in a manner of speaking, patrol the sector held by the Fourth Division. The condition of the Allies at this time is interesting to consider. Pershing in his memoirs remarked that four months earlier (than July, 1918) the Germans had a preponderance of 300,000 rifles on the Western Front alone; that in March the Germans had dealt the British a smashing defeat, followed by a second defeat of the British in April; that in May the Germans had decisively beaten the French. No more impressive commentary on the lightning swiftness with which an advantage in modern warfare can change from one force to the opposing force could be produced than a cursory statement of the Allied situation in the first few weeks of July, 1918. The Allies, who only four months previously had been beaten back in such desperation that Field Marshal Haig's famous "Special Order of the Day," dated April 11, 1917, is now a famous document of the World War, were in July the numerical superiors of the Germans by more than 200,000 men. On April 1, 1918, the Germans had a strength in rifles of 1,569,000 to the Allies' 1,245,000; but on July 1 the Allied strength in rifles was 1,556,000 to the Germans' 1,412,000. Never again thereafter did the German strength in rifles increase. On November first they could muster only 866,000 rifles in active service on all sectors of the lines which they held. Such was the tremendous effect of the thousands of fresh, eager young American "amateur" soldiers on the fortunes of war on the blasted, crater-pocked soil of France. A curve devised to chart the successes of the Allies in the year 1918 would have to indicate the gradual expansion of offensive maneuvers and an upsweep in tactical victories almost precisely in proportion to the number of American soldiers despatched to France and rushed to the front. No other conclusion is possible. Colonel Leonard P. Ayres, who was chief of the statistics branch of the American General Staff during the War, has written that "two out of every three American soldiers who reached France took part in battle." We know that 2,084,000 soldiers reached France; we know that 1,390,000 of them fought at the front. Had they not done so, William II of Germany, instead of penetrating French territory to make his personal headquarters at Charleville-Mézières on the Meuse River at the northern boundaries of France, might have proceeded to Versailles, as his father did in September of 1870 as the Crown Prince in command of the Third German Army. He might even have proclaimed himself king-emperor of a vast new European domain, as did his grandfather at Versailles in 1871, when the white-bearded William I announced himself to the world as emperor of a unified Germany in the mighty tradition of red-bearded Frederick Barbarossa. The sad-eyed woodchopper of Doorn might have done many things, had it not been for the 270,000 American soldiers who fought in the Aisne-Marne offensive from July 18 to August 6, 1918, who made possible the unparalleled triumphs around Saint Mihiel from September 12 to 16, and who forged irresistibly onward in the last, stupendous offensive in the Meuse-Argonne from September 20 to November 11. Chronologically, the beginning of the downfall of the Kaiser was the date October 21, 1917, when the first American soldiers entered the Allied lines at Toul. By the evening of July 2-3, the Fourth Division was withdrawn from the front lines and was bivouacked in units in the vicinity of Monnes, Marizy-Saint Mard, Hautvesnes, Brumetz, Saint Quentin, and Marizy-Saint Genevieve, with divisional headquarters at Bonneville, The division was reassembled as a reserve force for the Sixth French army; several hundred men entered our ranks as replacements, and we buried 303 dead in cemeteries at Chevillon and the Bois de Cobourg. We had the benefit of a short rest. The men cleaned up as best they could, new clothing was issued, and ammunition and sundry supplies were furnished. Most of the men slept under the trees or next to thickets in the shelter tents that were sold in America after the war as "pup tents." As much relaxation as was possible amidst the anger of the distant guns and the unending chatter of machine guns and French Chauchat automatic rifles was gained during this respite back of the lines. Then, on the 24th of July, the Seventh Brigade left us to join the Seventh French Army Corps; on the 26th Brigadier-General Ewing E. Booth came to us as commanding officer of the Eighth Brigade; on the 28th as the result of a conference Pershing had with Allied commanders at American headquarters at Chaumont, the entire Fourth Division became a part of the First Army Corps, commanded by Major-General Hunter Liggett. For the first time since we reached French soil, we were finally under undisputed American command and control. Although none of us knew it at the time, post-war revelations have indicated that General Pershing at the Chaumont conference, of which I have written, successfully fought plans of the French and British commanders to have American divisions assimilated as parts of the French and British armies. In fact, "Black Jack" told André Tardieu, director of the Comité Central des Affaires de Guerre, in plain Army explosives to cease uttering derogatory remarks about the American army and its officers. In a letter to Secretary of War Newton D. Baker, written on July 28, Pershing described the incredibly low morale of Allied soldiers other than Americans, reporting that Foch and others of his retinue had absolutely no hope or intent of winning a decisive victory in 1918. At 6 o'clock in the evening of July 28, the entire Fourth Division, less the Seventh Brigade, which was concentrated in the Bois de Chatelet, marched out by way of Priez and Sommelans to the Bois de Sommetans, where a halt was made for the night. The Seventh Brigade was placed at the disposition of the commander of the Forty-Second Division (the famous "Rainbow" division), Major General Charles T. Menoher. One of the great comforts in a soldier's life was the speed and efficiency with which he could receive letters from home and write to his people. Soldiers in our forces could send mail to the United States free of postage, and at any itinerant Post Office a soldier could buy a money order which when sent to some person (usually a mother or wife) in America would be honored as readily as any domestic money order. All mail for the 4th Division was brought to the divisional Post Office, where our postal clerks sorted it for distribution. It was then taken in trucks to the various units. Trucks bearing mail for the soldiers made at least one trip each day, no matter what the condition of the roads or the weather might be. All officers realized that reception of mail was close to the heart of every soldier, and every effort was made to speed the mails, no matter how fierce the fighting might be. It was the duty of the officers to censor the outgoing letters written by their men. To facilitate the process, soldiers gave the finished letter and addressed envelope, unsealed, to their superior officers, who thereupon made such deletions or alterations as they deemed expedient. Occasionally letters written by officers were censored by other persons; who they were we never learned. On one occasion I caught a "cootie," lighted a match under a bit of wax so that the melted drops would fall on the parasite and enclose it, and mounted the specimen much as an entomologist would preserve some rare insect he had found. Affixed to a letter which I addressed to my fiancée in Iowa, the "cootie" reached its destination in an excellent state of preservation, although that letter was no doubt one of the least appreciated communications anybody ever received from me while I was in France. The American poet, Joyce Kilmer, a sergeant in the 69th New York Regiment, A. E. F., was killed on July 30 at Ourcy. He was 32 years old. The first and third battalions of the 47th Regiment of our division took part in the capture of Sergy, in what was certainly one of the most memorable engagements of the war. They faced fresh, courageous, experienced fighters of the Fourth Division of Prussian Guards, men who had come down from the fortress of Metz in eagerness to meet the brash American infantrymen who had been on the battlefields less than three months. The Americans finally seized and held the town on July 31, but suffered losses of 27 officers and 462 men killed, wounded or gassed. Few prisoners were taken on either side. The Forêt de Fère, not far south of Sergy will always remain in my memory as the scene of unequalled horror. Our 39th Regiment, in support of the 42nd Division, was taking up new positions to prepare for the march on August 2. At about 8 o'clock in the evening, the first battalion of this regiment was lined up with the men in columns of two's, when a German airplane suddenly swooped quietly over the forest and soared down to the tree tops. It so happened that the aviator was flying a course on an axis parallel with that of the column, and he dropped a series of bombs so quickly that the separate detonations could scarcely be distinguished. I was in a General Motors ambulance about a kilometer from the scene of destruction, in back of the 59th Regiment. Word came back swiftly that all medical units, ambulances and medical officers should proceed to the wounded men as rapidly as possible. We were traveling on a one-way road through the forest, and we had no lights. The way was thronged with men, so I ordered my driver to pull off to one side and attempt to skirt the columns of marching soldiers, in the hope of reaching the wounded men in front as speedily as we could. It was an offense that might well have been punishable by court-martial, because if men had happened to be coming toward us from the opposite direction, traffic would have been obstructed for hours. Try as we would, progress was interminably slow. It was dark under the heavy foliage of the large trees, and most of the time I was perched up on the hood of the ambulance so that I could see the road and direct the driver. Finally, we reached the little lane where the disaster bad occurred. I hope I may never experience such a shock again. By the time we rumbled up, the worst of the bloodshed and carnage had not long been over. The bodies of twenty-seven dead men were strewn about, lying where they had been struck or blown; the shrieks of almost a hundred wounded soldiers pierced the air. Every company in the first battalion had been struck. Men otherwise unharmed were weeping like little children, wringing their hands under the horrible shock of the blasts; others were wandering aimlessly about, speechless, with open mouth, and dazed, foolish expressions on their faces. The wounded and dying were calling out incessantly; some were threshing about convulsively on the ground like decapitated chickens in the death throes. Many men stood stock-still, mute and staring, transfixed by the force of the explosions. It was never discovered how the German aviator found these columns of men in the twilight, but it was believed that his success was wholly accidental. Possibly he was searching for an ammunition dump in the woods that the Germans had been forced to abandon in the face of the American advance, or he may have been trying to find an American artillery post. He hovered over the forest for more than an hour, dropping bombs and wounding or killing four more men of the 58th Regiment. THE NIGHT OF AUGUST FIRST, 1918, WAS AN occasion that ought to have sent Frenchmen all over the land into tantrums of delight, for on that night the enemy began his retreat to the Vesle River. A French legend had sprung up, as many legends spring up during any great military campaign, concerning the bad luck of le Boche since Good Friday of 1918. On that day one of his mammoth 14.2-ton guns, so powerful that its projectiles. soared 25 miles above the earth in flight and so tremendously charged that it could be fired only 48 times without being rebored, sent a 264-pound shelf crashing into the Church of Saint-Gervais in Paris, killing 11 worshippers. Another crashed into the Church of Saint-Mary Magdalene in the same city, clipping off the head of the statue of Saint Luke. The gun was situated in the Forest of Saint-Gobain, 75 miles away. I saw one similar to it later in the campaign. The great German offensive triangle that had been established in the spring of 1918, the southern apex of which was at Château-Thierry, the eastern apex at Rheims, and the western apex at Soissons, was slowly being effaced by the attacks of the French and Americans. The Germans, in retreating to the Vesle had lost a total of 30,000 prisoners, but once they reached their new lines at the Vesle they stiffened admirably and offered a stubborn and effective resistance. On the evening of August 2 the 4th Division went up into the line as a complete unit to relieve the 42nd, or "Rainbow" Division, which was to fall back for a rest. Our division post command was established at the Chateau de la Forêt, and our sector, roughly, extended from the Bois de Pisotte on the east, intersected the Mareuil-en-Dôle road in the middle of the Forêt de Nesles, and pushed westward to the northeastern tip of the Bois de la Porte d'Arcy. The Second French Army was to the left of our division. Pursuit of the Germans began on August 3. The 8th Brigade of the 4th Division, commanded, by Brigadier-General Ewing E. Booth, occupied the right portion of the advancing line, and the 7th Brigade, led by Brigadier-General Benjamin A. Poore, had the left side of the line. The Germans fought bitterly, contesting every inch of the battle ground, but were slowly beaten back under the ferocious assault of Americans who had been awaiting such an encounter for months. The French, cautious but thoroughly competent infantrymen since the days of the great Bonaparte, made the most of every opportunity that superior marksmanship and perfect knowledge of the terrain could afford. Frenchmen lacked the ardor and dash of the Americans, but they were sagacious warriors and as a rule were fully as competent as the Germans, who were trained to obey an order to the death, but were not taught the principles of fending for themselves in an emergency. 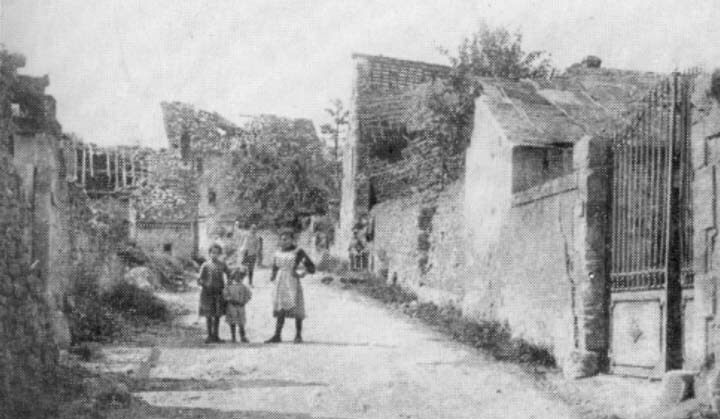 Ruins of the village of Ville-Savoye after the Germans had been driven out. The 59th Infantry Regiment had beaten its way into the village of Chery-Chartreuve, but slightly north of that heap of broken stones and splintered timbers it had encountered formidable opposition in the form of German artillery. During the afternoon I had been following a battalion of infantry across the countryside, over wretched, improvised roads and sometimes over mere towpaths. Once I stopped at the summit of a steep hill for a rest, and as I did so, I saw that a large, dun-colored touring car with one star affixed to the windshield had stopped nearby. General Booth and an aide left the car and walked back to a point at which they could not be seen easily, anxiously watching a long column of soldiers that was slowly toiling up the winding road. It was a very hot day, and many of the men were slogging along, not seeming to care greatly where they stepped or how they marched. As the first men approached General Booth exhorted them to straighten up. His words may or may not have been welcome, but at any rate, the men straightened themselves, pulled closer together in good marching order, and marched on with brisker steps and better alignment. Booth, a tough Missourian who had come up from the ranks, was a past master of profanity, but he was respected as a good commander and a just man. He knew how to handle his soldiers in a rough, stern manner that had a strong streak of kindliness running through it. He was stern, indeed, but no man who did his job the best he could had any reason to fear General Booth. I returned to the village of Villers-sur-Fère, south of the River Ourcq, and that evening I received orders directing me to go to Chery-Chartreuve. The 59th Infantry bad sustained heavy casualties during the day, and there were many wounded men who needed to be evacuated to the rear. I took two lieutenants, eleven ambulances and drivers and eleven orderlies and set out. We recrossed the River Ourcq, rolled into Fère-en-Tardenois, struck out toward the east for Nesles, and then proceeded north to Mareuil-en-Dôle, a village which for a while in 1914 had been the headquarters for Von Kluck and the First German Army. From Nesles onward the highway was in abominable condition. We were in the center of a region that had known terrific cannonading and hand-to-hand fighting only four or five days before; it had been German and was now French once again. Rain began to pelt us in torrents when we reached Mareuil-en-Dôle, and the twisting road soon became a vicious, boggy mass of churning black mud. We could not light our acetylene lamps, and in the darkness we had to drive doubly slow to avoid striking columns of marching soldiers. Suddenly, as we approached the village of Dôle, we saw the flashes of German shells in the distance, and we could hear the muffled crash of exploding missiles above the din of the thunderstorm. The Germans were retreating, but they had left numerous machine gun nests and units of artillery behind them for rear guard action. These gunners kept up an incessant punitive fire directed at the advancing Americans and on this particular day the firing had not ceased until nightfall. The driver of each ambulance was held responsible for the safety of the ambulance next behind him. I was seated in the lead ambulance, and as we clattered into Dôle I began to think of the rest of the machines. We stopped our ambulance to wait for the rest to come up. None came. Angrily, I walked back along the morass we had just traversed. Staggering through the quaking slime, drenched with rain and with no lamp to guide me, I made the best of the occasional flashes of lightning until I finally reached one of the lieutenants with his driver. The three of us trudged on to the rear until we discovered nine ambulances drawn up beside the road. They were empty. To say that I was furious would not be adequate. I was furious, astonished and baffled, all at once. The men who had manned these machines apparently had vanished into the inky blackness of the night. Not a trace of them remained. The driving rain long ago had washed away all footprints. Yet I was expected to report to the dressing station at Chery-Chartreuve with eleven ambulances. Many wounded men were awaiting us, and they were in desperate need of all the attention we could give them. As the three of us stood there, the shadowy figures of three men loomed up out of the darkness. They were American artillerymen who had been trying to extricate a fieldpiece that had sunk to its hubs in the mire. They told us they had seen some of the drivers climb down from the seats of the machines and walk to the rear in a southwesterly direction. We could distinguish the outline of an old stone farmhouse about a hundred yards off the road, and we decided to search the structure before venturing further in quest of the missing men. The place was dark and quiet, and as we came closer we could see that the old house was largely in ruins. But we perceived a dull glow that seemed to emanate from what once had been a cellar window. Approaching it carefully, we saw that an olive drab Army blanket had been stretched tightly across the aperture to keep light inside from shining out. Down we went into that cellar. There were our missing men, dry and comfortable. The cellar was being used as a dressing station for a machine gun company, and the lieutenant and his men had appropriated it. I proceeded to give them hell. I flayed them until their heads hung low and they stared at their shoes. Finally, I harried them out of the cellar and into the ambulances. "I am not going to lead my men straight into shellfire!" he objected. I silenced him and ordered him to his ambulance. He it was who bought the large knife in the hope of meeting a German whose throat he could slit, but on this night be had but very little fight in him. Later I learned that he had given the order which sent the men to the farmhouse, but I did not report his conduct. We drew near the village of Chery-Chartreuve at about 1 o'clock in the morning, after one of the slowest, most nerve-racking rides I have ever experienced. We approached the town from the southwest, and across our road we found a small stream that had overflowed its banks under the pressure of the deluge of water from the rains. A bridge had once spanned the waterway at this point, but the Germans had blown it up as they retreated. There was no way to get over the stream with the ambulances, so we searched for the most narrow portion of the torrent in the hope of jumping to the opposite bank. I waited for a flash of lightning, then ran precipitously forward and leaped --- into the very center of the stream. But the two men who followed me hurdled the swollen rivulet without even wetting their heels. On we walked, closer and closer to the front lines. We found a battalion dressing station situated in the basement of an old shop. Inside, a dozen or so wounded men lay on the floor or on litters. None seemed to be severely injured and we discovered that their wounds had been adequately dressed, so we concluded that it would be folly to attempt to evacuate any men in the midst of the heavy rain, over flooded, greasy roads. We stayed at the dressing station for the night and evacuated the wounded men to a field hospital the following morning. The next day I went out to Les Pres Farm, which lay about a kilometer north and east of Chery-Chartreuve. The farm buildings had been built in the center of a meadow and were surrounded by a high fence. In contrast to other dressing stations I had seen, the one that had been established here was not sheltered by woods, thickets, or even brush. I was surprised to find it so conspicuous, especially since the enemy was so close. On the 5th of August, from the vantage point of this farm, I beheld one of the most fearsome sights of any I saw in France. The 3rd Battalion of our division was marching north toward a small stream. To reach the stream, the infantrymen had to traverse an open field lying west of the village of Mont Saint-Martin, their objective being the Bois de Châtelet. Thus, the Germans had excellent targets in an unimpeded stretch of territory, and their gunners made the most of the opportunity. They laid down a murderous barrage of shells and machine gun bullets, and men sank to the ground in scores, some to flounder about spasmodically and then lie still, others to leap up screaming with their hands clutching their bellies, only to be struck low by another sheet of bullets a moment later, and still others to lie quietly and then work their way cautiously into some nearby foxhole or chance depression in the ground. Some of the men melted away into combat groups, hugging the ground as they, half-ran, half-crawled forward. Others flattened themselves to the earth, lay there for a few moments, then wriggled their way to the refuge of the woods ahead. We could see exploding shells gouge great holes in the ground and throw up vast clouds of débris and earth. After the dust and black smoke had drifted away, we could see the wounded men lying very still or grovelling in pain on the open plain. Then the litter-bearers dashed out like agile crabs, administering first aid and rushing the stricken men back to Les Pres Farm. It was a panorama that made me shudder, but I could not turn my eyes away from it. We all wondered that the 3rd Battalion had not lost many more men than those who were shot down during this intrepid dash across the field. Later, as the 1st, 2nd and 3rd Battalions pushed on toward the river, casualties became very heavy. We worked all that afternoon, night and the next day in dressing the wounds of fallen soldiers. We took them to Mareuil-en-Dôle, where we found that the roads were as congested as ever. It was becoming increasingly difficult to get the men to field hospitals quickly enough, so I set about to obtain more ambulances. On one of these forays of mine I met the bluff Missourian from Bower Mills, General Booth. We approached each other on the road between Chery-Chartreuve and Les Pres Farm, and he stopped me and questioned me about the number of men that had been wounded and how we were managing to transport them to the rear. I reported to him as briefly as I could. "Good, good," he said. "I'm glad to see that you're up close enough to do some good. It's a damned sight more than I can say for some of the other medical officers." I walked back to the rear, snatching rides wherever could get them and going the rest of the way on foot. When I reached the Service of Supply to ask for the loan of a few big Army trucks, a young second lieutenant confronted me and asked what I wanted. I told him that two or three hundred men lay wounded at Les Pres Farm, unable to be taken out because we had too few ambulances. "Well now, that's a lot of wounded men, isn't it?" he said vapidly. I succeeded in getting six large dun-colored Army trucks and drivers for them. We lumbered back over the old battered roads to Les Pres Farm, arriving there just before nightfall. As the first huge truck backed slowly into the farmyard, I called out that all men who felt able to climb on board the truck should do so at once, because they would be transported to the rear immediately. Men literally swarmed to the truck. More men leaped up than possibly could have ridden in that truck; the scene reminded me of a flock of hens who fly up in a frenzy of excitement on a load of corn that is being hauled into a barnyard. Yet I did not blame the men. They were not cowards. They had been wounded in honorable combat, and in my observation, men wounded first invariably are the best soldiers. Poor soldiers take cover at the first opportunity: they hide where no one, either friend or foe, would be likely to find them; they keep their skins whole and live to hide again and again. The good soldiers, as I saw them, rushed forward until they either reached their objective or fell where a bullet or fragment of shell with their "name written on it" ripped through them. 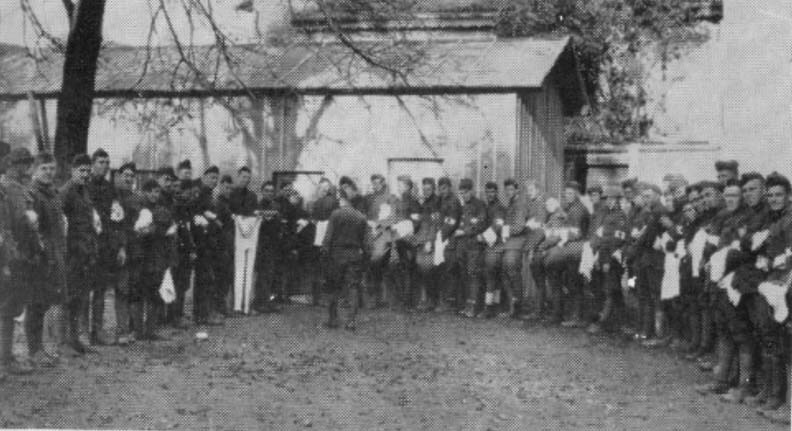 The wounded men at Les Pres Farm were clearly entitled to all the facilities a field or base hospital had to offer them. The ministrations available at a dressing station are only temporary expedients; wounded men need rest and prolonged efficient care. I do not imply that the men at Les Pres Farm were anxious to get out of the zone of battle; they were merely seeking the medical and surgical attention that was their right. But we worked all that night, using both trucks and ambulances, in evacuating the men from Les Pres Farm. The next morning I walked up to the village of Mont Saint-Martin, a kilometer or so northeast of Les Pres Farm. The town lay just to the right of the big swath of the 4th Division was cutting as it slowly pushed the Germans backward. I noticed that the American infantrymen had dug in behind stone walls and other barriers. The hollow, muffled exploslons of Springfield and Enfield rifles augmented by the intermittent roars of bursting German shells created a fearful throbbing in our ears. We seemed to have driven straight into a sector in which a pitched battle was raging, but we managed to evacuate the wounded men from Mont Saint-Martin and get back to the village of Chery-Chartreuve. In the afternoon of that day I took an ambulance and drove to the shattered town of Ville-Savoye. It was a veritable hellhole. The little village, about a quarter of a mile from the Vesle River in the wooded valley of that stream, was at this time under a furious bombardment by the Germans, whose artillery emplacements were strategically situated in the heights on the other side of the river, commanding almost the entire countryside. We were in full view of the enemy and within easy reach of the shells the German gunners were sending toward the town with exceptional ferocity. Nothing happened to us on the first trip, On the second trip, however, as we approached the town at about dawn, we saw a strange sight in the valley below. A greenish-yellow cloud hovered thickly over the region in a dense, motionless pall. It was mustard gas, a violent irritant which would blister the skin at contact if the concentration were sufficient. Toward the end of the war this type of gas was used extensively in shells, being released when the projectiles exploded. Ville-Savoye had been bombarded mercilessly all the preceding night and the gas we saw had accumulated during the darkness. A week or so before we could not have ventured into that sinister-looking cloud for our ambulance full of gold. But on this particular morning we simply rolled down the steep road and rushed through the noxious fumes without much concern. The gas had been so greatly displaced by air that we felt only a slight smarting of the mucous membranes of the eyes and nose as we sped by. Dressing stations bad been set up in two very deep stone cellars in Ville-Savoye. A man probably was as safe there as be would have been anywhere else in the village. The walls were thick, and the ceiling, which was formed by what was left of the first floor of the old building, was supported by great timbers that no doubt had been hewn by hand and fitted with infinite care, after the manner of most building in rural France. The doors of the two cellars had been hung with Army blankets drenched with water to keep out poison gas. I lived through what must have been one of the most deathly barrages of the war. The Germans sent tons of steel and iron crashing into the town for hours on end, and detonations were so monstrous that the earth and walls about us shuddered and trembled, even though we were far below the surface of the ground. Our ears rang with the mighty tumult, and the very air in the damp cellar vibrated until it was painful. At times we could not hear the spoken voice, so we sat with our backs to the wall, wondering speechless on the floor when the infernal din would cease, or whether we would live to know quiet when it returned again. Shortly our own artillery thundered into action, and then the terrific clamor began anew. On the 7th of August, as I was clambering cautiously up out of the cellar, I heard screams and shouts for help that seemed to come from an old church across the lane from our station. I glanced about, saw nothing, and then perceived that the shouts echoed from the tower of the church. I stole across the lane to an ambulance and told its driver, Private Robert L. Worden, to follow me. We skirted the church nervously, for machine gun bullets were zipping by in sheets and gas shells were exploding too near us for comfort. As we hoisted ourselves through a window of the wrecked church, bullets spat savagely into the rock walls, ricocheting with shrill whines. While we laboriously climbed to the tower on a ladder that had only a few rungs remaining, we could hear the dull thud of missiles that buried themselves in the crumbled fragments of stones below us. When we at last crawled into the steeple a fearful sight met our eyes. Second Lieutenant Lowell H. Riley of the 58th Infantry was dead --- literally blown to pieces. First Lieutenant Peter W. Ebbert was horribly wounded and was. in excruciating pain. A corporal lay on the floor, twisted by pain. He had suffered a fracture of the left femur. "For God's sake!" Lieutenant Ebbert begged me, "give me something to relieve the pain!" I administered one-half a grain of morphine sulfate, hypodermically. The three men had been in this tower for about three days. They had served as volunteer observers, and already had sent back much valuable information when a shell crashed into the church steeple and inflicted the terrible wounds we saw before us. We were at a considerable distance above the ground, and we were afraid that another shell would strike the steeple at any moment, but we managed to cut a hole through which, with improvised slings and litters made from blankets, we lowered Lieutenant Ebbert and the corporal. We did not attempt to move the body of Lieutenant Riley. Ebbert died soon after he reached the ground, but the corporal was taken to the dressing station, where a Thomas splint was applied to his fracture. "While driving on ambulance through the town he heard cries for help. Voluntarily and under heavy shell and machine-gun fire, he climbed a tower, in which he found 2 officers and a corporal severely wounded. He rendered first aid and assisted in carrying the wounded men to a place of safety." That church tower was the most conspicuous building in Ville-Savoye, and although it made an excellent observation post, it also constituted a perfect target for German gunners, who had attempted to raze it with typical Teutonic methodicity. To say the least, they were eminently successful.